is a London-born urban anthropologist with Nigerian-Irish / English-Guyanese roots. As a former Reader in Anthropology, Ifekwunigwe taught for ten years at the University of East London (UK). She is currently Visiting Associate Professor of African and African American Studies at Duke University, Durham. She holds a joint PhD in Medical Anthropology from the University of California, Berkeley. Commoning strategies are often improvised even in the liminal spaces that emerge in the cracks of Fortress Europe, says urban anthropologist Jayne O. Ifekwunigwe. 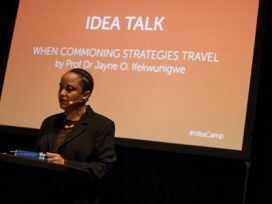 In a text based on her September 2015 talk at the ECF’s annual Idea Camp, Ifekwunigwe calls for a new commons that embraces both the mobile and the settled.